Written on 17 October 2028 . The amusement business and attractions industry has been around since the late 1800's with a wealth of knowledge and experience behind it. 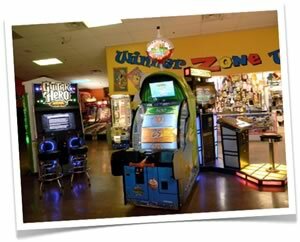 For new fun center business developers, looking to start an arcade business or their own family entertainment center, there are a great many resources and pools of information to dive into. This amusement articles archive is a great place to spend some time in and check back often. This section of the Family Entertainment Center website is about helping you find and research the amusement business with information from our own archives and other industry professionals and experienced fun center business operators. We understand the thirst for knowledge a new fun center developer is awash with, and present the articles in this section as an all-you-can-eat buffet to help you in the understanding of amusement business demographics and the eternal amusement lease vs. buying your location question. For a new fun center business, the biggest challenge can be finding your fun center funding, but before you can even really start to think about finance questions, you first must learn the 10 steps to start a family fun center or best determine if your new amusement business is really an entertainment center or if you are about to start an arcade business. Written on 14 October 2023 . The amusement business holds a lot of excitement and promise for the new entrepreneur looking to start something of their own. What's not to like about working in a fun environment all day? But as with any new startup, there has to be a business opportunity to make the leap from working-for-the-man, to working-for-thyself. The process to really determine the business opportunity falls to the feasibility study and that process starts with a look at the demographics. To clearly determine your local market opportunity and the potential of your fun center idea and it's profitability, you must get an understanding locally of the community demographics. Do you spend more time courting new prospects or adding value to existing ones? Most B2C (business to consumer) businesses I know get the mix all wrong. They spend tons of time, energy and money trying to bring in new clients. If they spent 30% of those resources on existing clients, they would be far better off. Why? Because existing clients already know about you so that cuts down the sales time, and selling costs. If you've ever watched Shark Tank, you know the 'sharks' are big on customer acquisition costs, and when it comes to your retail location, it's much easier and less expensive to turn an "inhouse" customer into a repeat customer, vs. the broadcasting costs of finding and dragging new customers into your family fun center. Exisiting customers are also more likely to refer you new opportunities. And referrals are much easier to close than cold calls. Whether you are an existing operator, or still on the startup path, here's a few tips to maximize your customer relationships. As an existing fun center business, think about your advertising. Is it directed to new people or existing clients? Exactly. Sure some of you have or are thinking about a loyalty program, but how is it working?Maybe a better question is how are you working it? The single biggest way loyalty programs fail is because companies don't tell their customers they have one. Or maybe they tell them about it, but they don't explain it correctly. The key to a family fun center loyalty program is to make sure the customer feels GREAT about being loyal to your business. This means you need to make sure there is value in being loyal - and it should be a big deal. Make sure your staff knows this. What about a referral program? Are you incentifying your existing clients with a reason to come back to your place AND bring someone new? You don't have to over think this. Make it easy on you and them. It could be as simple as a BOGO (buy one get one) laser tag, a handful of arcade game tokens, 100 redemption tickets or a free hot dog. Weekly specials or discounts: Pick your slowest night and offer the best specials. It doesn't matter if it's on food or on gaming or on something else...just give people a reason to show up. Then watch them do it. Pretty soon your slow nights, become your busiest nights. Be mindful that when choosing a loss leader (fancy term for something you may lose money on to get people in to spend more money elsewhere) that you may lose money on this offering. Don't ever make these special offers without the fine print. You can also do things that reach your customers outside of your venue IF you do the right things while they're there. What are you doing to collect their information? If you have a rewards program you can get their name, e-mail and maybe a phone number or home address. If they have to sign a waiver you can get their name and e-mail at the least. You can ask them straight away if they'd like to sign up for e-mail discounts and coupons. How else can you get their info? Direct mail- You can send surveys, product announcements, special promotions and more. They can be a postcard or a big fancy envelope with lots of info inside. This idea works a LOT better if you have their address. If not, than go the Val Pak route and pop a flyer in the envelope. Don't like that idea? Find a direct mail firm who can deliver mail based on a zip code and target a few of your neighbors. Social media- You have started a Facebook page, right? If you haven’t, now wouldn’t be too late to do so. Get your people involved in what’s going on in your world. Give them insight on how to enjoy your space more. Let them know from your perspective how they can work better with you. Add value to them. Always remember that your clients NEED (well, at the very least Want) you to be successful so you can continue servicing them. They are some of your biggest fans. Treat them as such! Remember the first time you heard the phrase “Attention Deficit Disorder”? Did you think “no way” or were you like most people and thought “yeah, I have a bit of that”? Fast forward to about nine years ago when the phrase “social media” started showing up everywhere. If you were in business, you were told it was a great way to market your product or service. And while this is still true today, EVERYBODY is doing it. The more people doing it, the more noise there is. The more noise there is, the harder it is for you to be sure that your message reaches your audience. You can’t let the noise stop you. You have to come up with content and posts that cut right through it and that your audience enjoys. With that in mind, I offer you the following ways of Being that will help you start conversations and continually earn the attention of your tribe. Be funny- The world loves a clown. If you hear a good joke, “borrow” it. Make humorous observations about everyday life. I heard this guy named Jerry Sign something or other…turns out he made a mint doing that. Be quotable- Can’t think of anything original? Use someone else’s quotes. We have a whole history full of them. Can’t think of any quotes? Don’t worry, you can go over to Quote Land, they’ve got you covered for years. Be relateable- The fastest way to build relationships is to create common ground. Talk about shared experiences. Everyone eats, listens to music and for this point looks at Facebook. Talk about local bands, bars/restaurants, and other local experiences to your center. Be sure to tag the places you’re discussing so they will talk about you too! Be interesting- Share relevant information that is topical to the day. DO NOT POST ABOUT POLITICS. This is a sure-fire way to alienate 37% of your audience and irritate 60% of them. Feel free to post about other relevant topics though. Be interested- Ask about them. “ME” is everyone’s favorite topic. Ask about people’s thoughts. What experience do they like best? What about their kids? When was the last time they did x, y or z? What are their plans for the upcoming weekend, summer or holiday. Engage people by letting them talk! Be thought-provoking- Say something that gives folks pause and makes them go hmmm. People like people (and companies) who think. Show off that brain power. Remember the Arsenio Hall Show v 1.0? Yeah, I’m old too. Be helpful- Offer tips that will improve others experience. Think about the most frequently asked questions you get. Make a list of 10 of them. Answer each one. Now you have 10 separate posts that will help people better understand your business. Be bold- Chris Matthews on Hardball doesn’t get the big bucks because he’s namby pamby…he dots you between the eyes with his opinions. I’ll admit this becomes a bit of an acquired taste and not a great starting point. But once you have YOUR tribe, you can absolutely do this! Be yourself- This last one is THEE most important. No sense in trying to be someone else because you’ll “attract” the wrong type of people. What thoughts would you add to this conversation? See what I did there? The absolute best practice I can share with you is to create a content frequency matrix where you schedule out your posts in advance. Make a folder on your computer (or phone) and save different types of content you see that fits these ideas. Know what kind of content you’re going to share on each day and share it. Make it a habit. It becomes so much easier to share content regularly if you already have it.